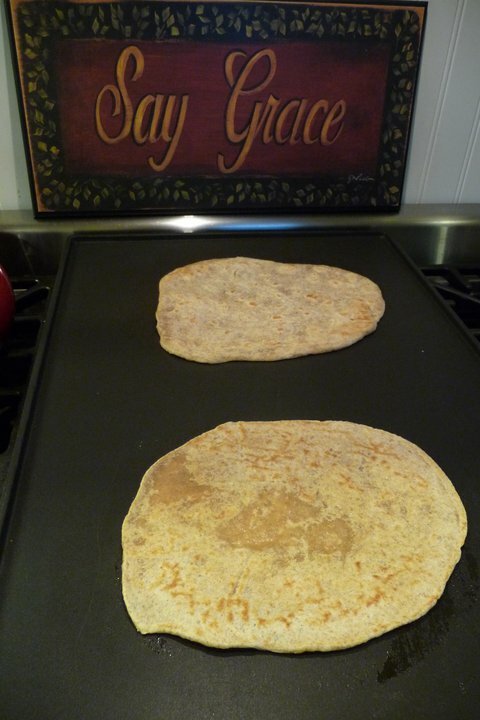 Making your own homemade tortillas takes a bit of time, but the result is delicious! And, the great thing about this particular whole grain tortilla recipe is the flour is soaked for optimal nutrition. You can also use these to make your own Homemade Tortilla Chips. 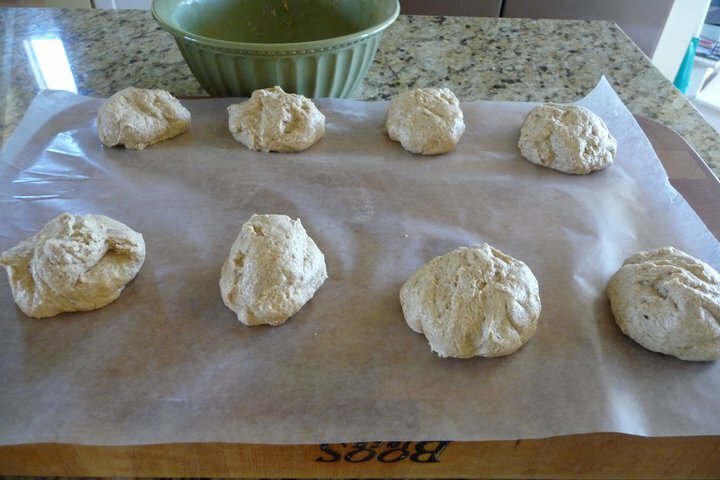 After dough is done soaking, add rising agents and then form into 8 dough balls. Allow dough balls to rise for 5 minutes and then roll-out between two sheets of parchment paper … not too thin though, or they’ll be hard to transfer to the griddle. 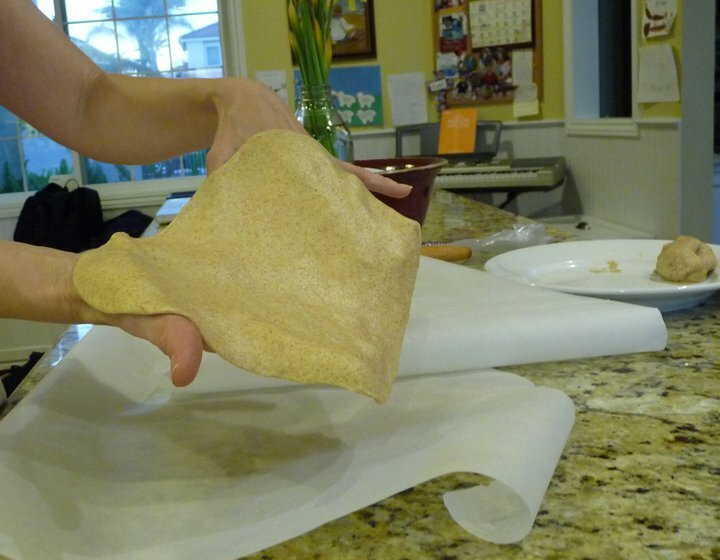 Remove the top sheet of parchment, then flip the tortilla over onto your hand and gently peel back the paper. The flattened tortilla looks and feels a lot like pizza dough, somewhat tacky/sticky. Transfer to griddle. Follow instructions in recipe below, depending on whether you want to eat them right away or save for later. Enjoy! These delicious and nutritious homemade tortillas are great for making wholesome wraps and tortilla chips too! In a large ceramic (or glass) mixing bowl, whisk together the water, kefir, butter and honey. Using a fork, stir in the flour. Using your hands, knead mixture into a dough ball, making sure to incorporate all of the flour into the dough ball. Then cover the bowl and place it in a warm area of your kitchen for 12-24 hours. After soaking time is complete, sprinkle the baking powder and salt across top of soaked dough. Using your hands, knead the rising agents into the flour until the dough is workable, but not too stiff. Shape dough into 8 balls, place balls on a sheet of parchment paper and let stand 5 minutes to rise. When rise time is up, preheat griddle over medium-high heat (or preheat a large skillet). Top these delicious tortillas with your favorite “fixins!” Yum! 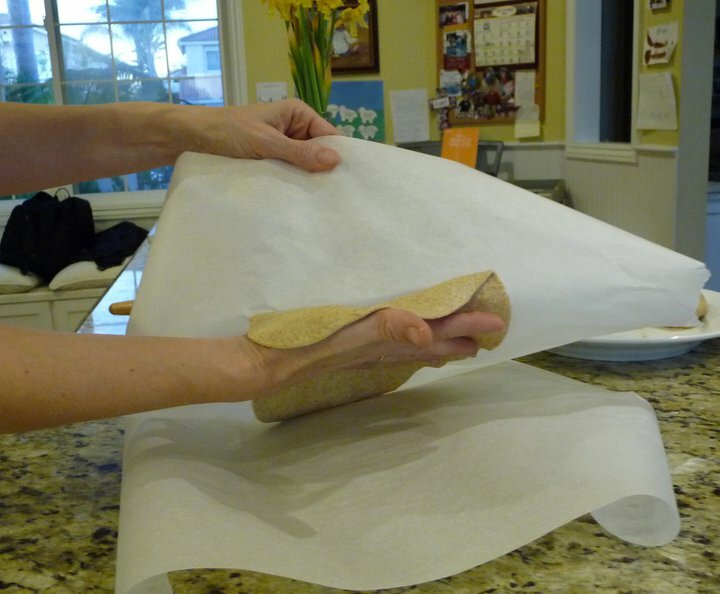 Reader Tip: Trish shared a comment about her technique for tortilla rolling that I thought may be of help as well. Trish says, "I use a gallon size ziplock bag and cut off each side. On the OUTSIDE you can mark with a permanent marker little dots of how big you want your tortillas to be. Then, put one of the tortilla dough balls on the INSIDE and roll out the dough. So easy!" Cooking & Freezing Tip, if you're making tortillas for future use: Place flattened dough on a lightly buttered griddle and cook only about 20-30 (do not brown). Using a large spatula, flip over and cook just another 10-15 seconds. Place tortillas on wire rack to cool completely. 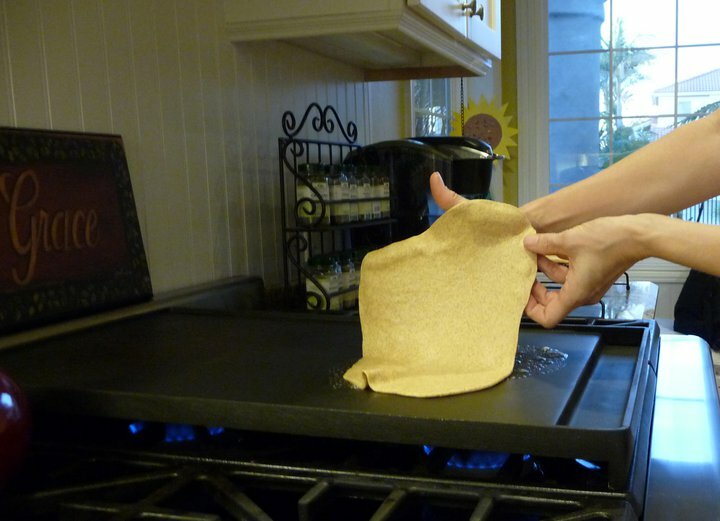 Once cooled, place tortillas on a large baking sheet and put sheet in freezer. Once tortillas are frozen solid, place them in a freezer-safe container with a sheet of parchment or plastic wrap between each and store in freezer. When ready to use, simply allow tortillas to thaw about 10 minutes. Preheat griddle and cook as outlined above. If you're Grain-Free, be sure to check out the links to my favorite GF tortilla recipes (listed at the beginning of this post). These look delicious! I am trying to do more “real food” with my family. I was wondering if there is a specific reason to use kamut flour instead of whole wheat? I have spelt flour, but not kamut…could I sub whole wheat for kamut? Also, if I don’t have kefir, can I substitute plain yogurt or buttermilk? Thanks!! I just made your tortillas today with all spelt. I also didn’t have kefir so I put 1 TBSP of greek yogurt in 1 cup of water. I didn’t have a problem rolling them out at all. I used a pastry mat from Tupperware and it works great, especially with your spelt thins 🙂 They look so delicious I can’t wait to eat them! I do have one question, they came out kind of stiff and not flexible like store bought kind. I’m wondering if I might have over cooked them? They get nice & soft again if I warm them though. Any thoughts? I can’t wait to try these, but I will have to substitute using spelt and buttermilk, most likely. I did have a question about the griddle you use. Is it cast iron and where did you get it? Thanks! I made them today and I like them, my mom is from Chihuahua, Mexico and she makes very delicious tortillas, so I learned how to make them round and pretty, instead of making 8 balls I made 18 and then I used kalmut flour to spread on my counter so the tortillas didn’t stick to the counter, then I rolled the balls in the flour and with a rolling pin I extended the tortillas, the secrect is to use enough flour on the dough so it doesn’t stick to the rolling pin and also every time you extend the tortilla turn it around just a little so it extends round and nice. The dough was very sof (I didn’t expect it) and the tortilla was very delicios. These look awesome, do you by cgance have nutritional info? I normally but whole wheat toetillas that have 9 grams of protein. It would be awesome if these were close to that number! What stores do you shop at to find the special products used in this recipe? Do you shop in health food stores or are you finding more main stream grocery stores carry products like kaput flour? 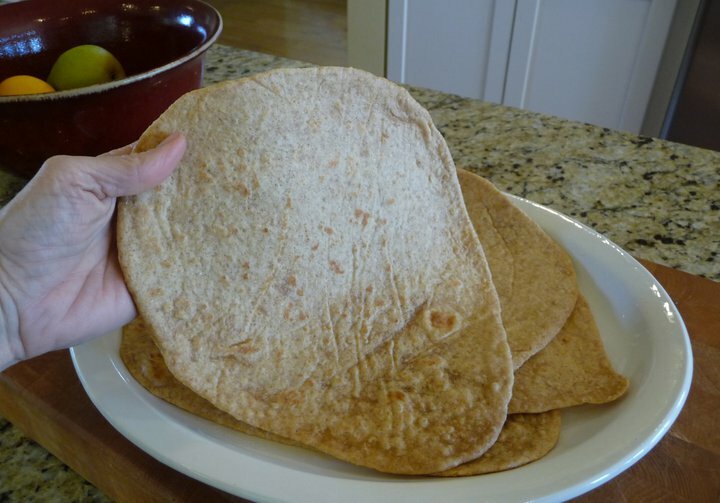 I have been using the homemade tortilla wheat flour recipe from passionate homemaking and loving it. After reading the Maker’s Diet, I’m super excited to get some spelt and kamut and try this! I love the clear instructions you give but I do have one question– what rising agent do you use and is it absolutely necessary (yeast packets I guess?) The whole wheat ones turned out so delicious with no rising agent. Also, I have never in my life soaked grains before…a little nervous. I really liked the linked pizza on tortillas and the details on freezing. Have to bookmark your blog. Could I use whey instead of kefir? I am new at soaking and I have not made milk kefir yet (but I do have water kefir if that would work). Thank you for your site…you are my new go-to recipe place. So I just had to share my funny experience with these tortillas with you. I have made them several times and I will never eat any other tortilla again. Well I had never used sprouted spelt flour before but thought since I found it locally I would try it with this recipe. Tacky is an understatement. lol But on a brighter note I just took the scraps of cooked tortilla and baked them into chips and made some fermented salsa. Needless to say the didn’t make it very long. I have an even easier way to roll out the tortillas. I use a gallon size zip lock bag and cut off each side. On the OUTSIDE you can mark with a permanent marker little dots of how big you want your tortillas to be. You then put the tortilla dough on the INSIDE and roll out the dough. This is soooooo easy! Hope that someone can use this tip. Both of my little ones have dairy issues, can I substitute something like apple cider vinegar for the kefir/whey?